Last week was Meet-Up related to NB-IoT in Munich. Some Newbies were listening to NB-IoT details the first time. What they don’t know but I know – NB-IoT is already live in the region of Munich. The akorIoT community made a scan in Rosenheim close to Munich and found an NB-IoT bearer in the guarded band. The left peak marked with yellow dots shows the NB-IoT bearer. 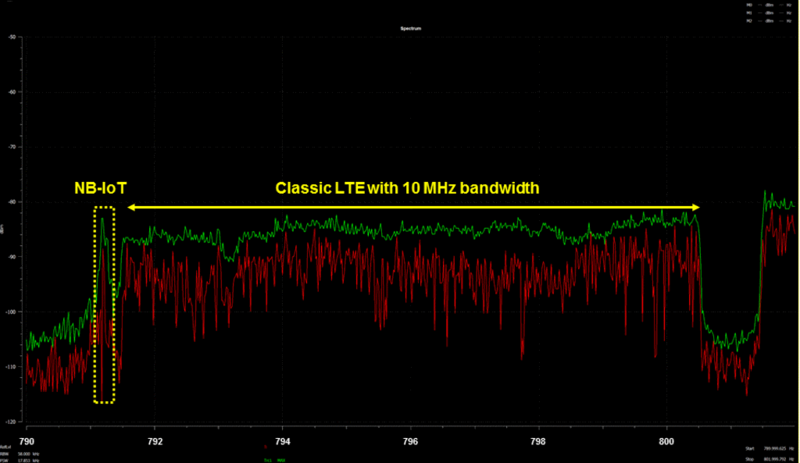 At the right side of the NB-IoT bearer, you will find the classic LTE bearer with its 10 MHz bandwidth. Do not hesitate to drop an email to harald.naumann (at) gsm-modem.de and do ask for your own personal NB-IoT scanner (Euro 35) or your own akorIoT radio adapter with NB-IoT module and Arduino header (Euro 109).